I have always been invited by my friends to join fun run but I always decline them because I knew I will not be able to finish a single 3 kilometer stretch. Maybe I was just telling this to avoid stressing my body that is starting to grow bigger. I remember on my last APE (Annual Physical Exam) that I am a little overweight according to the doctor. I decided that before the year ends I should be able to join any run. To make myself ready I trained in our office's thread mill every week for an hour. I did this to have my body in condition in case I will be deciding to run. Why the heck did I buy my running shoes for if I would not run? And so an email regarding KaRUNungan 2010 was circulating among my officemate. It was a post from Pinoy Fitness whom I know works in another department of our company. Well this maybe my time to run since the run was for a cause so why shouldn't I give it a try. KaRUNungan 2010 was spearheaded by the Knowledge Channel Foundation Inc. The run's main cause is to continuously provide educational programs to 2000 public elementary and high schools. This is done through all-educational cable television channel called Knowledge Channel. And so I printed a copy of the registration form and selected 5 KM run. You may ask me why choose 5 KM when there was a 3 KM. First of all, my colleagues will be running the 5K run, it would be disappointing if I will be different from them. Second, they tell me that 3K run is too short and I should be trying the 5K to test my running capability. And so November 28 came, the day of the run. I do have 2 things in mind that Sunday, first is that I will not collapse due to exhaustion and second to finish the run. And so after waiting for the 15K and 10K start their respective run, we watched some intermission numbers and did some warm-up exercise. 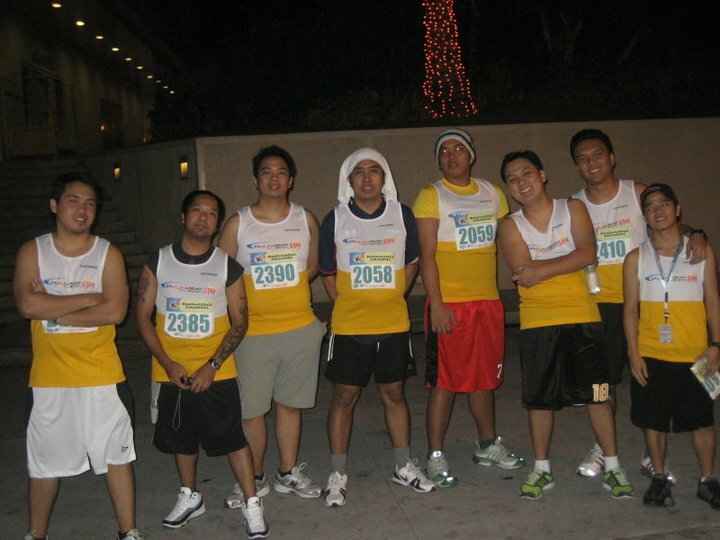 We started the 5K run afterward and we opted to be in the middle to be at par with the rest of the runners. After the first five minutes I slowed down since I cannot force myself to run or jog. I needed to finish the run but not in a way that might hurt myself. So I just walked and was left behind by my companions, they mentioned that we'll still see each other at the finish line. I then managed to use the advantage of the downward slope of the Meralco flyover and gain some distance and after sometime decided to walk again. And so I finished the run after 54+ minutes and I was ranked around 500 out of 634 recorded 5K finisher. I think this was not bad for a newbie runner like me. Hopefully, on my next run I will be able to beat this record. Photo on left was taken 50 m to the finish line. You may check the KaRUNungan 2010 race results here. takbo!5km run. nice. ilang pounds nawala sa pagtakbo? 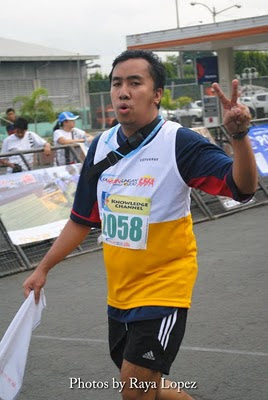 i did not run to lose weight, i run because somebody is chasing me, hekhek..